Many trials have been done in the past to segment digital audiences in ways that are relevant for publishers, including looking at who pays for online news and identification of the 3 news subscriber personas. Our favourite example is Reuters’ breakdown of reader types by frequency of access and interest in news. 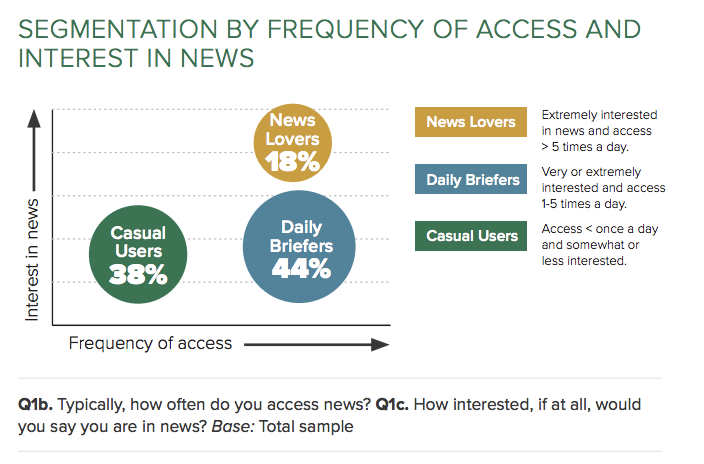 In this example, the highest percentage of news readers are ‘daily briefers’, which supports our vision of edition-based publishing being the future of news. Recently two new academic articles on the behaviours of online news readers have been published. To keep you up to date, we have the key takeaways you need to know on the 5 behaviours of digital news readers and why people avoid reading the news. A new report from Nir Grinberg, a research fellow at Harvard, identifies the five types of reading behaviour for digital news and how to best engage each reader type. Grinberg found that while he had a variety of data available to him, there was a clear lack of digital news-specific metrics. From his research, Grinberg identifies 5 types of reading behaviours: “Scan,” “Read,” “Read (long),” “Idle,” and “Shallow”. The type of news content affects the type of reading behaviour, with sports news having more scanners (people are quickly looking for a match result) while how-to news has more idlers, with people following the instructions in real-time. By understanding how the news content will affect reader behaviour, publishers can better format their stories for more engaged reading. For example, sports and financial articles can see longer reading times by withholding some information from the beginning of the article. On the other hand, magazine-type articles can provide a lot of information in the beginning and still enjoy long, engaged reading behaviour. This knowledge can also be used to improve recommendations of related content. By distinguishing the type of reader behaviour best suited for the article, recommendation systems can then match readers with new articles based on their engagement profiles. 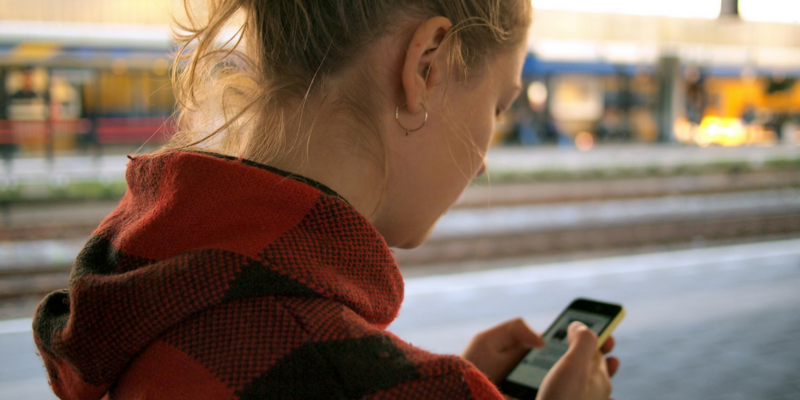 Relatedly, Tristan Ferne, R&D for BBC, has identified 12 types of news formats in his article “Beyond 800 words: new digital story formats for news”, in which he explains how such formats help encourage reader engagement as well. A sixth type of reading behaviour is avoiding the news all together. This type of reader bevaiour was researched by Benjamin Toff and Rasmus Kleis Nielsen in a study funded by Google DNI. In their report “I Just Google It“, Toff and Nielsen researched how infrequent news readers rely on social media and search engine algorithms for their news. From this, they found three different types of news avoiders. “The information is out there”: these interviewees said that if they were unclear on a news topic, they have the ability to search the internet for more information–pointing out Google as their way to consume news. Many interviewees repeated the phase “I just Google it“; however having the ability to Google for more news and actually conducting a search are two different things. To solve the lack of digital news and edition-specific metrics, we embarked on the Digital Reader Engagement (DRE) project back in 2015. Since then, we have learned what happens in the body while reading and turned this into our Google DNI-backed product EngageReaders which gives newsrooms actionable insights on a daily basis. In our analysis, we split reader behaviour into three segments: scanners, core readers, and one-time readers. Furthermore, using predictive modelling, EngageReaders is able to identify over-performing and underperforming articles and highlight hidden gems. Hidden gems are the articles which are read by a limited number of readers, but are loved by those who did read it. Knowing the hidden gems can help improve placement of similar articles in the future. Understanding user behaviour at this level can help publishers to build a better newspaper for their readers in the future. In addition, EngageReaders measures reader satisfaction for each edition, laying the foundation for a more engaging product offering. Finally, the awards system highlights when articles reach a special milestone, such as the most time spent on an article or the most openings, allowing the news room to know when they are at their best. This entry was posted in Industry news and tagged Digital publishing, Mobile publishing, Reader Engagement. Bookmark the permalink.